Joseph Kabila Kabange, former president of the Democratic Republic of the Congo, at the United Nations in 2018. Washington, DC — Today (March 21, 2019), the U.S. Department of the Treasury’s Office of Foreign Assets Control (OFAC) sanctioned three senior Democratic Republic of the Congo (DRC) officials. Sarah Gardiner, Investigative Analyst at The Sentry, said: "The U.S. Department of Treasury’s announcement of sanctions toward three electoral commission officials from the Democratic Republic of the Congo is an important step in ensuring accountability for electoral fraud during Congo's December 2018 presidential election. Today’s designations are also the first to be taken under the U.S. Congo sanctions program since February 2018. The new U.S. sanctions are a step in the right direction, but if the U.S. is going to have an impact on systemic corruption in Congo, much more extensive financial pressure on corrupt actors is needed." 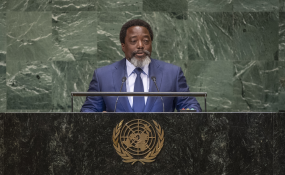 Sasha Lezhnev, Deputy Director of Policy at the Enough Project, said: "Former President Kabila has formally left office, but it is clear that he and his inner circle still hold the keys to power in the Congolese government. Targeted sanctions, anti-money laundering measures, and prosecutions against Kabila's inner network, financial facilitators, and their networks of companies will be critical to create the political space needed for much-needed anti-corruption reforms that Congolese civil society is rightly pushing for." Copyright © 2019 The Sentry. All rights reserved. Distributed by AllAfrica Global Media (allAfrica.com).